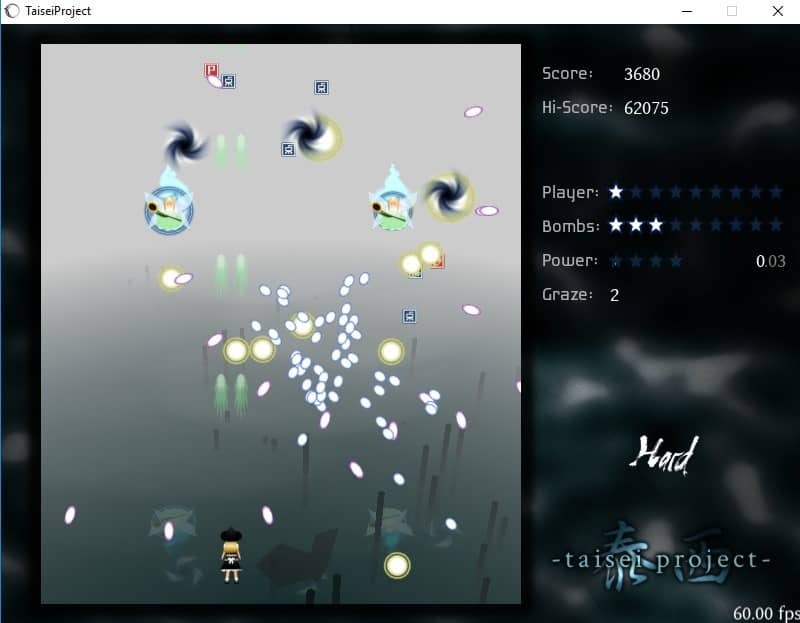 Taisei is an open source game for Microsoft Windows that is a fan-made clone of the popular Japanese bullet hell shooter series Touhou Project. I love Japanese shoot'em-up games ever since I got my hands on games like R-Type, Raiden, or Apydia. I love so-called Bullet Hell games even more even though I'm not particularly good when it comes to playing them. Bullet Hell games, as the name suggests already, throw an unbelievable number of bullets at you. The games are more about dodging enemy bullets to stay alive than shooting down enemies to prevent that they shoot at you in first place. Taisei is a free game that you can download and play on all current Windows PCs (and Mac OS X and Linux according to GitHub). The game is open source and you can check out the source on GitHub if you like. You need to install the game before you can play it, unfortunately. The game supports game controllers but you can play it with the keyboard as well if you don't have access to a controller. Taisei has four difficulty levels and two different protaganists with two different skills that you may select to play with. The game plays well even on the latest version of Windows 10; you try to dodge enemy bullets as you will lose a live whenever you are hit. You may collect items that enemies drop to increase your power level and throw smart bombs if you have any to clear the screen. Taisei features several bosses that you need to fight in order to proceed. While the game is not particularly long, it is quite challenging if you play it on any level but easy. Check out the following video which highlights game play and the massive number of bullets that are on the screen at the same time. You can practice any stage or boss if you find a stage or end boss particularly difficult to defeat. Note that some options are only available to you if you have been to that stage or boss already. The game ran flawlessly at 60 frames per second on a decent PC running Windows 10. Visuals are okay for a free game but they are not on the same level as commercial shoot'em up games. That does not mean that you cannot have fun playing the game though. Taisei is a free bullet hell game for Windows PCs, Macs and Linux devices. It features multiple stages and bosses, and four difficulty levels to ensure that anyone can play it. Beginners should definitely start with the easy difficultly level as it is difficult enough already for inexperienced gamers. If you played shooter games before, you may want to try the normal difficulty level instead and see how far you get. Now You: Which free games do you like or play? and do they wear hats? THIS is important. You can download the game in zip format, extract, and play in 32 or 64 bit versions, so install isn’t *needed* (but you may grab the installer if you prefer). The game itself is VERY impressive. If you play any touhou shooters at all you should be right at home here. X on the 360 pad is focus, which acts like a slowdown-mode for your avatar. Makes navigating bullets easier. When you’ve killed a bunch of enemies and the collectables drop (red powerups and blue score), you can go 3/4 up the screen to automatically pull them all in. The music nails the touhou feel and is very listenable, and the graphics are really only slightly different than those on an original paid game. For a free clone, this is VERY polished and dare I say freaking amazing. 360 controller and others are supported, and in addition there is a deadzone setting! Those with worn thumbsticks need not use Durazno or InputPlus to have a playable game here. Another quality of life measure is borderless window support, which worked great @1080p. Thanks for the heads up, I’m kind of blown away by how excellent this is. 5 stars, EASILY.